The Fruitful Wife: Cultivating a Love Only God Can Produce , by Haley DiMarco. Don't even waste time reading my review. Just go buy a copy and start reading. The end. That's pretty much all I want to say but it is probably best that I say a little more in order to qualify this as a "review", eh? Bother. I don't really want to talk much about The Fruitful Wife because I'm a far cry from being one! This book hit me smack between the eyes and really had an impact. (At least, I hope it did.) I received it for review roughly a month ago and I've been reading it very slowly; about half a chapter a day. Even then I felt like I was reading it too quickly. I should probably also tell you that I've already begun re-reading it because it's just that good in a horribly convicting sort of way! This book also goes down in Carrie history as being the first book I took a pen to. I underlined, dog-eared pages and covered it in i-Clips. It is also going to go down as one of my favorite reads in 2012 - not because it's fun but because it's just so good in a purifying sort of way. I've already (advanced) purchased copies for other people and it's going to be my new book which I gift new wives with. I'll tell them to read it once right after they get married and then again in about 3-5 years when married life starts to become real. (If you've been married for at least five years or more then you know what I mean.) It's not that you can't or that you shouldn't work on cultivating the Fruits of the Spirit (Galations 5:22-23) even before you are married. You should! But this book is going to be more impacting to you when you've discovered that you, by your own "love power" will only fail when it comes to showing your husband and family any of these fruits all by yourself. When you begin to recognize that there are some really hard things that you must go through as a married couple - (in order to grow! hard things are good things!) - and that you do not have it in you to show much love or kindness (or patience or whatever) in your own strength, then you'll start to really pay attention to what DiMarco has to share (and also what God has to say). While I would like to say that I wish I had read this book earlier, I can also honestly say that it wouldn't have had as great an impact any earlier. We had to go through hard things first and recognize that hard things will come again. It is life. It is right. I seriously have so many pages and passages marked in this book that I hardly know which to share. One reason I connected with it so much is because of DiMarco's honesty in sharing who she was and who she is with the reader. Now, strictly for example sake, let me compare DiMarco with Sally Clarkson or (an old favorite of mine) Elizabeth George. While I like both Clarkson and George, they both have this soft spoken nature about them. They are all happiness and joy and, quite frankly, I'm not the sort of person who is always smiling. Reading someone who feels like they are always smiling can get on my nerves and make me dismissive of whatever truths these lovely ladies are trying to communicate. DiMarco admits upfront, at the beginning of each chapter, that she almost feels as if she shouldn't be writing this book. Her personality is very straight forward, in your face, brash and loud, thoughtless, impatient and unkind . . . until God began to convict her of her sins. It is easier for me to hear the words of someone who explains that they are very impatient by nature and that they have learned, by and through the grace of God, to be patient. She describes her former emotions and attitudes as relates to each "fruit" of the Spirit in ways that made me laugh outloud because I identified. I'm an extremely impatient person. I am . . . unkind. I am frequently unloving and I am extremely selfish. Extremely selfish. People bother me. So, to hear her say, "I was this - but now I am not after repenting and immersing myself in scripture" was very encouraging. She gives hope as she explains that grace and the power of the Holy Spirit will help me and others to imitate God (Ephesians 5:1; 1 Peter 1:16) in being kind, being loving, being faithful and possessing self-control. I'll share a few notable passages, just to give you a flavor for the book. Don't blame me if you begin to feel convicted. Just thank the Lord. There are more. There are oh so many more passages I would like to quote but time and space will not allow for that at the present. Suffice it to say, I highly, highly, highly recommend The Fruitful Wife . 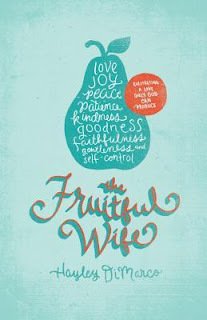 I am very happy to say that Crossway Books has offered up TWO copies of The Fruitful Wife to two of you. Would you like to win? Simply leave a comment below! This contest is open to U.S. Residents AND Canadian residents and will be open through Sunday, September 30th. THIS CONTEST IS NOW CLOSED. THE WINNERS, as selected by Random.org, ARE #17 - CrossEm (who is getting married shortly!) and #30 - Barbara H. Congrats, ladies! Thank you, Crossway Books, for publishing this book in the first place. Then, thank you for sending a copy my direction for me to read, in exchange for sharing my thoughts. (I'm always happy to do so.) Lastly, thank you for offering two copies for two of my readers! Yes, I'd love to win this book! I know I need it, too! I have been praying for self-discipline on the words that come out of my mouth! Sounds like this book could offer me some additional wisdom. Thank you for offering this giveaway! This sounds like something I'd like to read. Thanks! Wow! Okay, okay! Adding this to my list (you are so, SO bad for my list, chuckle). Looks like this one needs a nudge toward the top of the list, however, not to be added to the bottom. I love the sound of this book! It fits right where God is working in me. Please enter me in the drawing. I'm always looking for good books that challenge me in my role as a wife. I'd love to win this book!! Sign me up to enter. And thanks! Your enthusiasm is contagious. You're book reviews are dangerous to my TBR list and my Amazon shopping list! Count me in. If I don't win it, I'm going to buy it--looks great!! Wow--it sounds like I REALLY need to read this book. Sign me up, please! I am not a wife, but, Lord willing, am heading that direction. And since you suggested that I stay tuned for your giveaway, I figured it would be okay for me to enter despite being slightly outside the target demographic. This sounds like a very convicting book. It sounds very helpful! Thanks for the giveaway. I'd REALLY need a copy of this book! Well, this is timely. I've been struggling with impatience the last few days, and the first verse in my Daily Light book this morning was "Ye have need of patience..."
I normally don't care as much for "in-your-face" speakers and writers, though I do appreciate hearing from one is a a confessed fellow struggler. Sign me up! It sounds like I could definitely use this book! I also would like to be entered in the giveaway. But since it is the book you will gift new wives with, perhaps you'd like to wait till later? Circa Spring 2014? OH how I need to read this book. I am struggling with just about every fruit of the spirit these days. Now I wish I'd seen this in time to enter your giveaway. I have get my hands on this book. I am selfish. I am controlling. And I need to learn to be more like God. Sounds like a book that would be convicting. Thanks for sharing! I'm a little, shall I say, "behind" on reading your review on this book? Nonetheless, I want to read!